Why is anti-Islam activism on the rise in the Czech Republic - a country with virtually no Muslims? 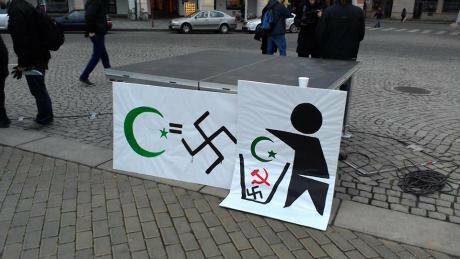 The anti-Islam petition stand in Olomouc. Photo supplied by author. "A shocking assault took place in the centre of the city of Olomouc. A stall with a petition against accepting refugees in the Czech Republic was attacked by a large group of Arab immigrants. The Arabs yelled, ‘In 15 years, you will all be our slaves!! We have so much money that we will buy up everything here!’ said a petition organiser and continued, ‘The Arabs began to destroy everything. They kicked into things, they broke up the stand. We were afraid for our lives! The police had to act.’"
This is a quote from an article published in Blesk, the most popular tabloid newspaper - read daily by millions in the Czech Republic - about an incident which allegedly took place in the North Moravian city of Olomouc on Friday 29th May. The shocking news item was quickly seized on by most Czech media and was widely disseminated throughout the country, especially on social networks. "A group of foreign students, with whom there have never been any problems before, expressed their disagreement with a xenophobic petition. Physical contact was provoked by the activists from the petition stand. I was really disturbed by the behaviour of the petition activists. A lady from the petition stand hysterically ran around and shouted: ‘My God, my God, we do not want these people here!’ Several activists from the group 'We do not want Islam in the Czech Republic' had divided the main square in Olomouc into zones and were deliberately trying to provoke panic in passers-by. I recognised many of these people as Nazi sympathisers and worshippers of Adolf Hitler (I have been studying the Neo-Nazi scene in the Czech Republic for many years and I know the Neo-Nazi activists, having testified against them at court on several occasions.) I have not heard the alleged statement that we would become the Arabs´ slaves in fifteen years. Most of the foreign students spoke in Arabic, which the Czech petition organisers do not understand, so I do not know where this assertion came from. I did hear, however, the petition activists say that they ´do know how to deal with this vermin and that there is only one solution to the problem´”. Other witnesses have also testified that there was no violence. One of the foreign students had apparently tried unsuccessfully to pull down an anti-Islamic poster. He is now being investigated by the Czech police. Significantly, the police have not started any criminal proceedings against the group "We do not want Islam in the Czech Republic". The Olomouc university authorities have published an apology from the student who tried to pull down the poster. The apology, which is somewhat reminiscent of the self-accusatory statements by victims of Stalinist show trials in communist Czechoslovakia in the 1950s, says that "Sadly, there are a minority of people carrying out heinous acts in the name of Islam," even though the student is trying to explain that Islam is a tolerant and peaceful religion. The student also felt the need to praise the Czech Republic in his statement: "Before deciding to study here, I spoke to numerous current and former students, all of whom are Muslim and all of whom gave high praise of the university and the Czech Republic as a country. I had no doubts I would enjoy studying here. I understand that I am a guest in your lovely country and so once more I’d like to profusely apologise to anyone who was upset by my actions." No students from Olomouc University and no university authorities have expressed support for the foreign students in Olomouc and their protest against anti-Islamic xenophobia. The Olomouc incident is significant for the saturation coverage which it has received in the Czech media and on Czech-language social networks. It can probably be interpreted as alarming evidence of the rise of intolerance and xenophobia in the Czech Republic, caused by ignorance and fear. These are deliberately exploited by extremist organisations such as "We do not want Islam in the Czech Republic". The group is openly tolerated by Facebook, where it has received more than 138,000 likes. Their anti-refugee petition has been signed by 145,000 Czech citizens to date and was presented to the Petitions Committee of Czech Parliament on 23rd June. The hearing of the Petitions Committee was attended by Dr. Konvička and a large group of his sympathisers, who voice a number of rather alarmingly racist comments (for instance warning that if the Czech Republic accepts any refugees from Africa and the Middle East, it will be infected by as yet unknown dangerous diseases). According to Konvička's supporters, most would be immigrants are able-bodied young men with military training and they would destabilise Europe. Just as the governments of Hungary and Slovakia, the Czech government refuses to accept the EU refugee quotas policy, but on 24 June, it made a bit of a U-turn by announcing that the Czech Republic will accept, voluntarily, “a few hundred refugees”, if the Czech authorities can decide on their own who to accept and whom to turn away. The Czech public is fed a large number of frightening anti-Islamic images and news items of dubious origin on social networks. But when you report the xenophobic or racist content to the anonymous Facebook managers, you invariably receive an automated reply saying "The page does not infringe our community standards". Facebook frequently accepts hate speech published on its pages in "minority" languages which would never be tolerated in English. In recent days, for instance, it took many protests by readers of the Czech political website Britské listy for Facebook to take down the pages which said, in Czech “Hitler had a good solution which can be used against the refugees” and “We can offer accommodation to refugees in Auschwitz, where there is work, space, showers and gas, and you can also participate in interesting medical experiments”. For quite a while, Facebook responded to the complaints saying that “this page does not infringe our community standards”. Officials of the local authorities in a number of villages in Moravia have informed the citizens about the anti-refugee petition by means of their public address systems and told them that the petition can be signed on the local authority premises, in local libraries and in pubs. A leading activist of the group "We do not want Islam in the Czech Republic" is Dr. Martin Konvička, a member of academic staff at the Faculty of Biology of the University of South Bohemia in České Budějovice. While hate speech against race and religion is theoretically a criminal offence according to the Criminal Code of the Czech Republic, punishable by two years´ imprisonment, criminal charges have not been raised against Dr. Konvička and his extremist followers. On the contrary, Dr. Konvička has allegedly tried to hound out a pro-Palestinian student activist out of the university before her final exams. The inactivity of Czech authorities with regard to Islamophobia and anti-Arab racism may be connected with the strong and uncritical support which Czech politicians tend to show to Israel. A group of international celebrities including Ken Loach, Roger Waters, Noam Chomsky, Alice Walker and Hedy Epstein have recently protested against "Jerusalem Days", a Jewish Festival organised to be held in the West Bohemian city of Pilsen, which presents Jerusalem as an Israeli city. The Festival has gone ahead anyway and its organisers called the protesters "antisemites". The anti-Islamic statements repeatedly made by the Czech President Miloš Zeman, who calls Islam "an ideology" and compares it to Nazism, have recently led to a reduction of trade links between Saudi Arabia and the Czech Republic. The group "We do not want Islam in the Czech Republic" parasitically use the fear of the unknown within the Czech population, who have not had any experience with immigrants (almost no Muslims live in the Czech Republic) and are frightened by news reporting about the atrocities committed by the militants from Islamic State in the Middle East. The Czech Republic, like many other former communist countries, is a fairly closed community, whose citizens are mainly dependent on information circulated by local, Czech-language media. There is no public information campaign explaining to people that refugees and Muslims are also human beings, in fact Czech politicians tend to side with the anti-Islamists and anti-refugee activists in their public statements. The intolerance, due to fear and ignorance, is turning into a major destabilising factor in Central Europe.